AMPLIFIER TECHNOLOGIES, INC. 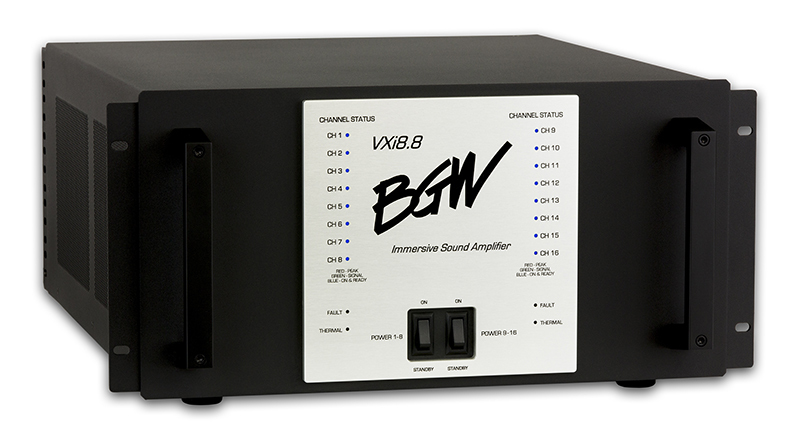 BRINGS BGW IMMERSIVE SOUND AMPLIFIERS TO CEDIA. Montebello, CA , October 14, 2015 - Amplifier Technologies, Inc., the prolific manufacturer of many of the high end audio's best amplifiers today displayed its latest BGW Immersive Sound Amplifiers in Booth 5312 at the CEDIA Expo. Designed in recognition that increased channel density required to playback Dolby Atmos in a commercial theater would lead to significant crowding in the projection booth, Morris Kessler and his team designed a series of high-channel-count, flexible amplifiers. All use dual-differential balanced circuitry, Thermal-Trak output devices, current feedback and dual DC Servos (the same basic topology used in Kessler's award-winning Signature Series ATI amplifiers) to deliver what we at ATI believe is the highest quality audio ever available in a commercial setting. To maximize these amplifiers suitability for commercial use, they feature rack-mounting, forced air cooling, clip-limiting and can be outfitted for remote telemetry. When so enabled, the status of each channel can be monitored remotely using such devices as an iPad or iPhone. Conversation with our home installation consultants tells us that these same features are valued for home theater. Each of the 6 amplifiers in the BGW Immersive Sound series is effectively two complete amps on a single chassis with two line cords, two toroidal transformers and two power switches. Each amplifier is rated for 3200 watts RMS total output with 1600 watts available in each side. In the VXi8.8 (pictured above) each side consists of 8 200W per channel amplifiers. In the VXi4.4, each side has 4 400W RMS amplifiers per side, while in the VXi2.2, each side is rated at 800W RMS x 2. These BGW amps are so versatile, they are even available in split configurations with 8 x 200W available on one half with 4 x 400W (the VX.i8.4) or 2 x 800W (the VX.i8.2) available on the other half. According to Kessler, "These amps have been a huge hit in the world of commercial cinema. We powered an entire theater with one VXi8.4 for Jurassic World and could monitor every critical operating parameter right from my iPhone." All BGW amplifiers are assembled in ATI's factory in Montebello, CA. MSRP for the amplifiers, regardless of channel count, is $8,890.00. They are available now.